Basic Information | Dopravní podnik města České Budějovice, a.s. The current public transport in České Budějovice is provided by buses and trolleybuses on the total of 22 routes..
53 vehicles move off to 8 trolleybus routes in full operation during working days. Traction lines supply of the trolleybus network with direct-current of the voltage of 750 V is provided with 4 converter stations remote-controlled from the energy operations control of the Transport Company. The total installed output of converter stations is 6,400 kW. Trolley lines achieve the length of 72 kilometers in terms of single-track, including manipulation sections. The trolley network includes total 156 switches. Total 152 km of power supply cables are placed in the ground. 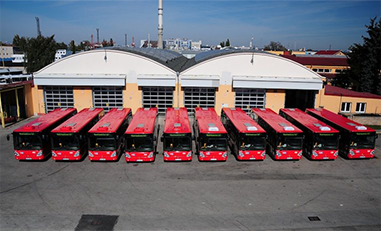 There are maintained in the depot 25 articulated trolleybuses of ŠKODA 15Tr(M) type, 31 low-floor articulated trolleybuses Škoda 25Tr Irisbus and 2 low-floor articulated trolleybuses Škoda 27Tr Solaris..
VThe MHD vehicles run in České Budějovice about 6 million kilometers and transport about 39 million passengers per one year..